Primary Natural Resources coal, natural gas, titanium ore, iron ore.
MOZAMBIQUE IS located in southeast Africa and is about twice the size of CALIFORNIA. It is bordered on the north by TANZANIA, on the east by the MOZAMBIQUE CHANNEL of the INDIAN OCEAN, on the south and southwest by SOUTH AFRICA and SWAZILAND, and on the west by ZIMBABWE, ZAMBIA, and MALAWI. The only natural borders are Lake MALAWI in the northwest between Malawi and Mozambique and the Rovuma River, which forms part of the northern border with Tanzania. The Mozambique Channel separates Mozambique from the island of MADAGASCAR. Mozambique has 1,600 mi (2,575 km) of coastline that is interrupted by numerous river mouths. The rivers that run through Mozambique to the ocean include the Rovuma, Lurio, Incomati, Lugela, Revue, Save, Limpopo, and the famous Zambezi. South of the Zambezi, the coast is very narrow and the northern coast near Rovuma features rocky cliffs with numerous islets and lagoons. To the far south, just above South Africa, are Maputo Bay and the capital city of Maputo. The Zambezi River flows through the north-central area of Mozambique and is the most fertile part of the country. It is the only navigable river in the country with a heavy flow of water traffic from its mouth to the city of Tete. Above Tete, about 400 mi (645 km) inland on the Zambezi, is the huge hydroelectric plant Cabora Bassa. Most of the electricity created there is exported to South Africa. The Zambezi River is the fourth-longest river in Africa, stretching some 2,200 mi (3,540 km) from where it begins, looping through northwestern Zambia to the spectacular cataract of Victoria Falls on the border of Zambia and Zimbabwe, through Lake Kariba and finally entering Mozambique. Most of Mozambique is covered with tropical savanna and coastal lowlands that rise slowly inland to where they form plateaus, which are then broken by isolated mountain peaks. The highest of these lies to the north along the Zimbabwean border east of Lake Malawi and is called Monte Binga. One-third of Lake Malawi lies within the Mozambique border and this area is covered in tea and sisal plantations. Most of Mozambique’s income comes from agriculture, making it one of the poorest countries in the world: 75 percent of the country is rural, growing cashews, copra, tea, sisal, and cotton. In the south, they grow rice, sugar-cane, bananas, and citrus fruits. They do raise cattle, sheep, and goats, but their numbers are kept low by the diseasecarrying tsetse fly. Some fishing takes place in the Mozambique Channel and mainly brings in shrimp for export. Most of the population speaks a Bantu language and comes from 10 major ethnic groups. The Makua-Lomwe, living in northern Mozambique, make up nearly 50 percent of that region, along with the Yao and Makonde. In the center of Mozambique live the Thonga, Chewa, Nyanja, and Sena; in the south live the Shona and Tonga. 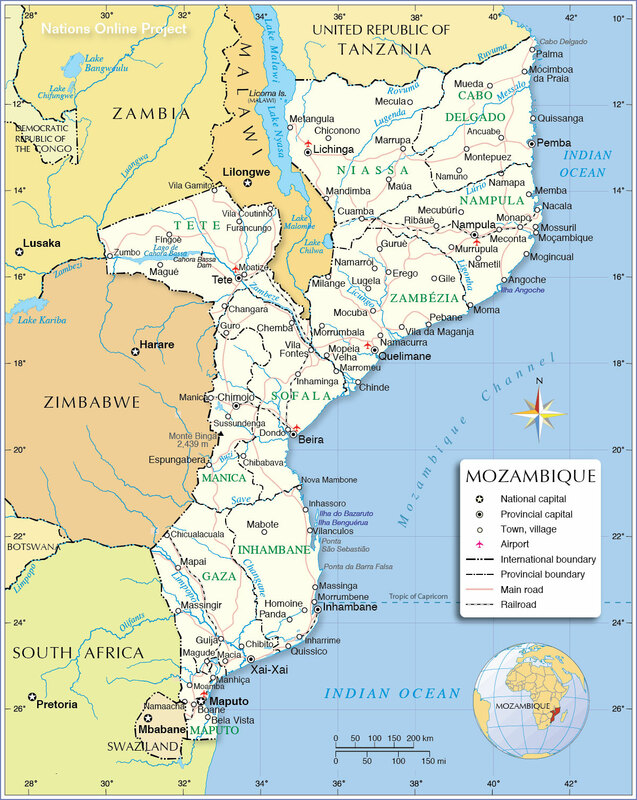 Mozambique gained its independence on June 25, 1975, from PORTUGAL. The country is structured as a multiparty democracy with a free market economy. Mozambique has suffered through spells of droughts and heavy flooding in the decade that have severely hurt the economy.